The purpose of this study is to solve the transmission gear rattle phenomenon. 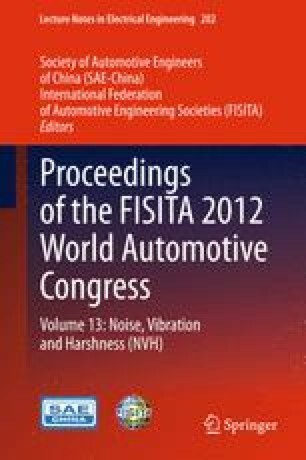 The whole vehicle transmission loss (TL) method is used to calculate air-borne rattle noise and to identify if the interior sound is dominated by structure-borne noise and air-borne noise. The major noise transfer paths are found. The experiment analysis indicates that structural transfer paths are identified as the major noise transfer paths for gear rattle noise. The paper provides two ways to improve the transmission gear rattle phenomenon. The test results show the good performance. Some structural transfer paths such as clutch cable, gear shift cables are considered and other factors such as drive half-shafts, suspension systems and subframe system are not considered. All structural transfer path parameters will be considered in the future research. Thank Dr. Pang Jian, Li Chuanbing and Yang Xianwu for their guidance and help in the completion process of this study, thank them very much! At the same time, thank all the colleagues of Changan transmission NVH group for their non-selfish help.